The story of Black Lagoon is definitely one of the more entertaining ones that I’ve had the opportunity to watch in recent years and it goes perfectly with the genre. Even from the start you can tell that Rock has more to him than what you might expect, it is pretty obvious when he recommends that the crew take out a helicopter with a torpedo by getting the ship airborne that he might just be meant for the world of crazy pirates and Revy has some of the best lines in the series, fitting perfectly with her badass attitude. 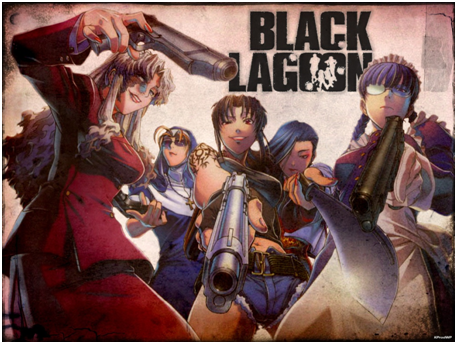 There is a whole lot of gun fighting, blood and foul language, but that is what you should expect from a series like “Black Lagoon” and without it I don’t think the series would be the same, or as fun to watch. All-in-all “Black Lagoon” is vulgar, violent and full of crotch shots, but all of that is probably what makes it so addictive. Along with an entertaining story the series is filled with characters that you love to hate and bad guys that you just can’t help but love. If you’re a fan of anime like Deadman Wonderland and Hellsing Ultimate then there is no way that you should pass up on Black Lagoon.